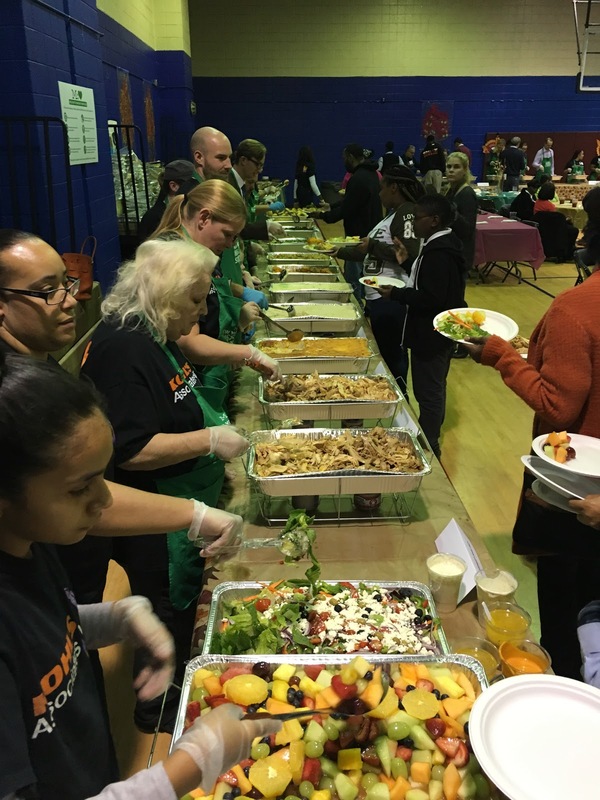 Striving to help its program participants and community members get a hot meal and save money for the upcoming holidays, the New York City Mission Society provided more than 200 meals at its 13th Annual Thanksgiving Harvest Community Dinner at Minisink Townhouse on Thursday, November 17. Mission Society Board Members Jean Shafiroff and Jay Moorhead underwrote the event. Joining Jean and Martin Shafiroff and Jay Moorhead and Missy Kilroy, serving food last night were: Board Members Laura Flavin, LTC Francis W. Kairson, Jr. (Ret. ), Peggy and John Bader, and Stanley Rumbough. They were joined by Young Professionals Society members Cole Rumbough, Natasha Das, and Jerry Bonura; guests Silda Wall Spitzer and Flo Anthony, volunteers from Kohl’s and Emma Lazarus High School, Mission Society alumni, staff, and community members. "As Thanksgiving approaches, we wanted to together our community and show that we understand challenges they face every day,” said Mission Society President Elsie McCabe Thompson.“We are thankful for all of the support, and in particular the generous contributions of Jean Shafiroff and Jay Moorhead, for ensuring that our program participants, their family members, and our friends in the community had a hearty meal and a great time." Deacon Rodney Beckford delivered an invocation prior to the dinner, and throughout the night, students enrolled in Mission Society’s GRIOT program, a partnership with the Afro Latin Jazz Alliance to teach musical instrumentation to youth, performed on stage and displayed their new artistic skills. Dozens of volunteers served turkey, stuffing, side dishes, and desserts from nearby Sweet Mama’s, and beverages. Sponsors this year included Vita Coco. The event capped off the Mission Society’s pre-Thanksgiving activities. Earlier, the Mission Society continued its tradition of distributing turkeys in advance of Thanksgiving. The turkeys were donated by St. Francis Food Pantries & Shelters and were provided to participants at several Mission Society program sites. I love love love seeing stories like this. This is why I love Thanksgiving - seeing people come together. Tiffany Pham and 6 others upvoted this.